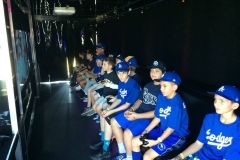 It’s the Greatest Game Truck in the Inland Empire! Limousine Style Interior Our Game Theater has a luxurious limo-style interior with comfortable Stadium-Style Seating for 24 or more! Climate Controlled Environment Regardless of the weather outside, the temperature inside will provide year round comfort! 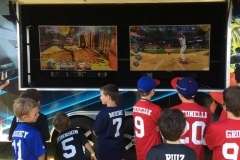 The Game Box Video Game Party Game Truck is fully air conditioned for those hot summer days and heated for chilly days in winter. 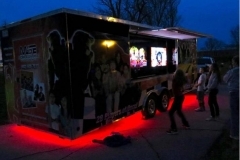 Laser and Under Glow Light Our laser lights change colors throughout the gaming experience. 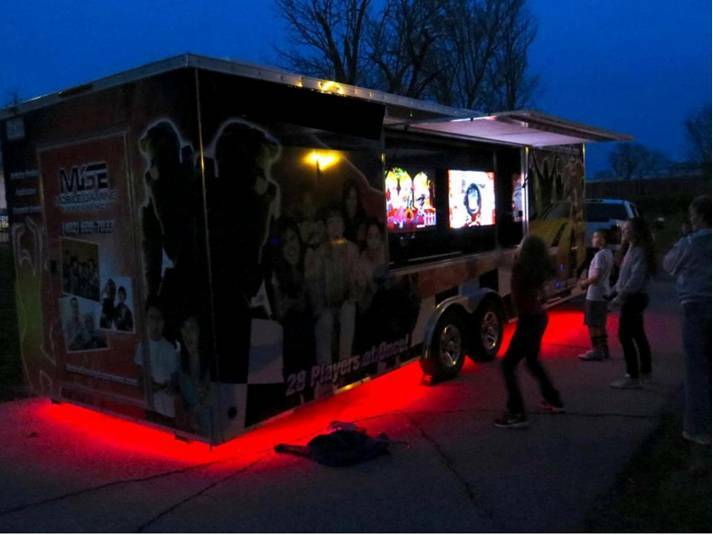 Plus, there is under glow lighting outside our Game Theater for an exciting nighttime display. 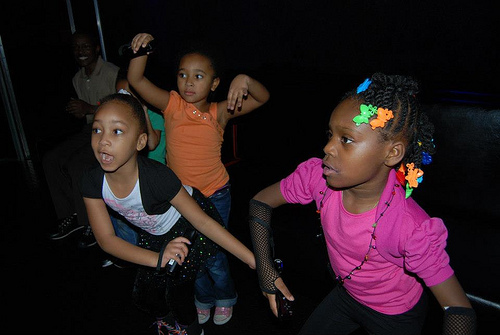 Kids literally refer to our light show as “Awesome!” Six Huge High Definition TV Screens! We have five high-definition flat screens inside our unit and two outside so players can enjoy dancing and sports games like Madden Football, FIFA Soccer, Just Dance and Wii Sports Resort. Latest Games Systems We have the best game consoles and plenty of wireless controllers for PlayStation 4, Xbox One S and Wii U. 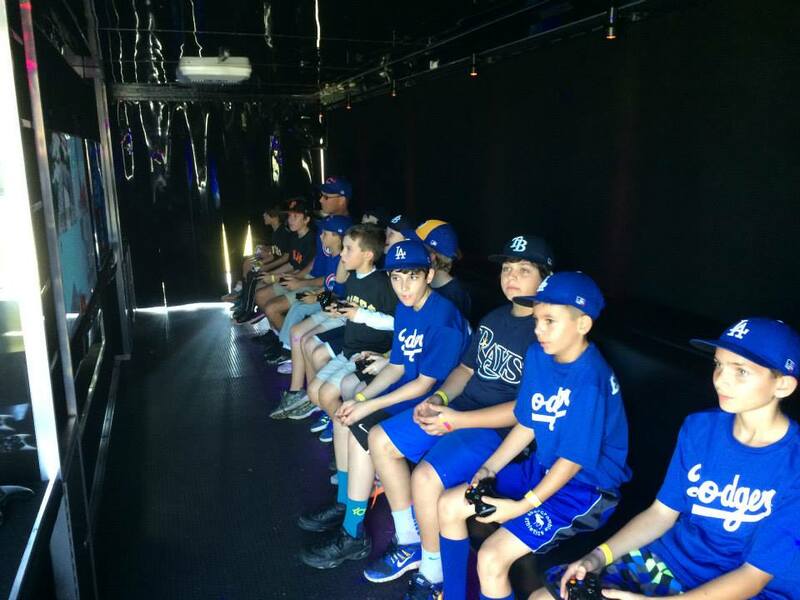 Our Game Truck Supports 24 Players For a full blown multi-player experience, our game theater has 4 gaming stations on the inside that support up to 16 players with space available for additional friends to watch the fun on our stadium seating. 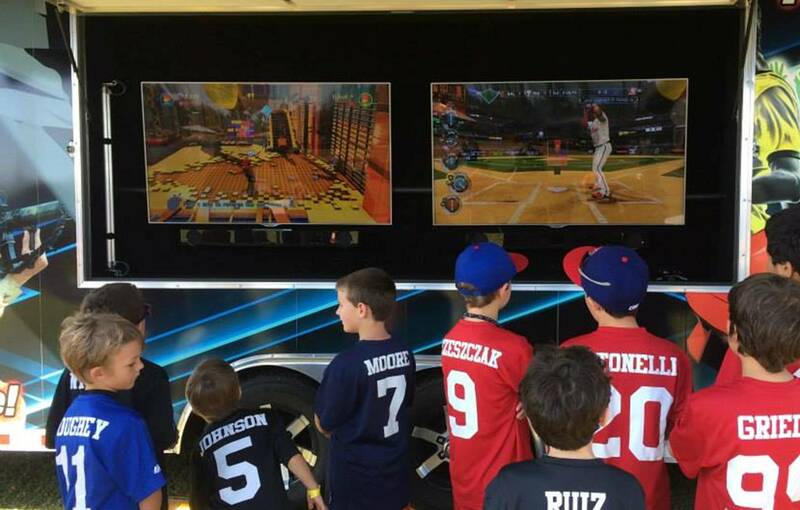 In addition, when weather permits, there are 2 more gaming stations on the outside that will support up to 8 additional players. HUGE Game Library We have one of the largest ever-expanding video game libraries available. With the most popular video games, and more on their way, gamers will have no problem finding the latest and best games to keep them entertained for hours! Mirror Me™ Photo Booth! The ultimate party photo booth! This high-tech smart photo booth is a touch-screen mirror that snaps custom "selfie" pics of you and your friends! Get your best pose on, customize your pic, even sign the screen.Our Mirror Me™ Photo Booth is included with every party…you and your guests will have great keepsake photo mementos sent to you right after your party! Kids and adults all love it! Surround Sound Audio System With powerful sound bars under every screen for an immersive experience, our audio system surrounds the players with rich sound. Fully Self Powered Our Game Theater has its own ultra-quiet generator to run all our systems. There’s no need to plug in to electricity at your house.